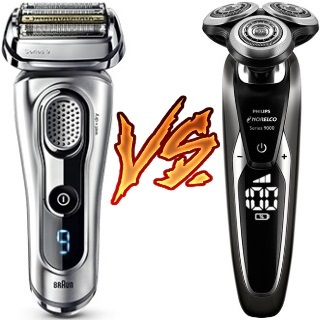 Braun and Norelco have been competing with one another in the shaver world for years. The two companies produce top-quality shavers for all budgets and demands. But which company makes the best ones? 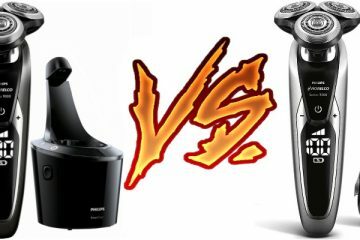 You’re about to look at a few Braun and Norelco shaver models in this Braun vs Philips Norelco shaver review. You will learn about the features of these shavers that make them so unique. There are four comparisons between Braun and Norelco shavers of different forms included in this guide. You must look at how well these can help you with getting a great shave going every time. All Braun shavers shave in a straight line. This motion is the most efficient way how you can shave. Braun razors collect more hair with each pass. You will also have more control over your razor. A series of comfortable foils will help you keep a straight line moving with every stroke. The shaving head can also tilt along the contours of your face, thus producing a comfortable shave every time. Braun’s shavers in its Series 5, 7, and 9 models come with the AutoSense system. The technology identifies how thick your hair is as you pass over. The AutoSense system changes the power supplied to your motor. The motor becomes stronger when the hair is thicker and needs extra power for cutting. Braun shavers are great for wet and dry shaving. The company’s shaving tools let you shave in any condition. In addition to shaving dry hair, you can also use the shaver on wet hair or hair covered with shaving foam or gel. Some models can also operate in the shower without the motor wearing out. You can clean off the shaver head under your sink in a few minutes as well. 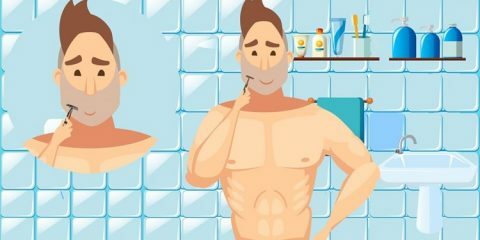 You will find a smooth shape on any Braun shaver you find. The German-inspired design focuses on precision and comfort. An ergonomic curved shape is found in every shaver. A few touch points are organized around the body to provide a firm space for holding the shaver. The control button is usually laid out around where your thumb would go. Braun’s shavers are suitable for left and right-handed users alike. You will get a charging station with most Braun razors. The Clean and Charge station is available with many of the company’s most popular razors, although you can also order the product separately. The design uses a base at you can place your razor on for a quick charge. You can also trigger the cleaning function on the inside to wash off the razor head and blades. The station also dries the shaving head when the cleaning cycle stops. Norelco’s shavers utilize a three-head rotary design. The heads are flexible and can move in multiple directions. The form provides a closer shave on your neck and jawline. You can use a circular motion when shaving with a Norelco model. The three heads also move independently from one another. A small pivoting post may come out under the rotary head to help you position the base at multiple angles on your face. Norelco uses the MultiPrecision feature in its shavers to raise and cut hair. The system’s rotary rings capture hair and then move the hair upward. The cutting element under the ring then trims the hair as it stands up. The hair is carefully picked up and then cut in segments. The first few blades shave the top part, and then the last few go after the rest of the hair. You can use a Norelco shaver in the shower if desired. The Aquatec seal provides a coating on the rotary heads to keep water from sinking deep in the shaving unit. You can shave with foam or gel too. Wash your rotary heads off under the bathroom sink to keep a clean surface throughout your shave. The added coating stays firm on the razor heads and will not wear out as you use the shaver every day or two. The edges inside Norelco’s shaver give you a closer cut every time. The NanoTech blade system uses small grooves to grip and cut hair. The spots are sharp and provide a firm cut at skin level. The rotary rings ensure that the blades will not cut through your skin. Even with those rings, the blades still trim your hair as low as you want while preventing cuts or burns with use. Each Norelco shaver uses a curved body. The design is narrow at the bottom and expands as you move closer to the rotary head. Some support grooves or pads are on the top part to give you a more secure grip. The power button is located near the spot you would put your thumb on. The design is ergonomic and easy to grip. 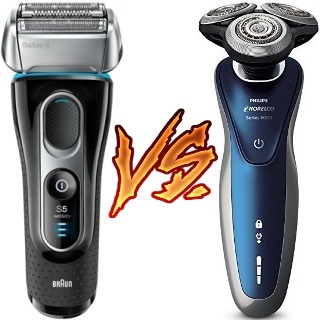 The first comparison to see in this Norelco vs Braun review entails two of the top models that the companies offer. First, let’s see what Braun has to offer. 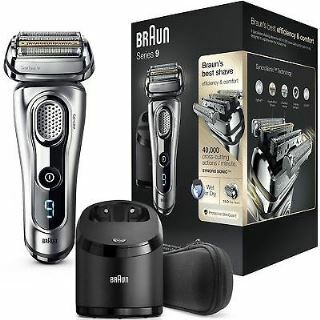 The Braun 9290cc is a high-end model that uses five shaving elements. Four cutters are used with a skin guard to provide more comfort while shaving close to your skin. A titanium coating is included on the foil cutters to produce a smooth and firm cut. The 9290cc pivots in two ways. First, the head can move in ten directions to give you a grip on each straight shaving stroke you make. Second, the foils and facial guard pivot back and forth along with changes in your skin. The guards respond to every curve along your jawline, chin, and other sensitive or minute spots. The Norelco 9700 is different as you can control the speed of the shaver. The 9700 comes with three power settings. The plus and minus buttons next to the power button let you switch between those settings. You can use a slow speed for a relaxed shave or for shaving harder spots, a medium shave for a basic trim shave and a fast shave for when you need to get going or you have a large space to cover. The eight-direction pivot heads cover more space along your face. Each shaving head operates independently from one another. The precise blades also target every hair regardless of how long it is. The foil rings on each pivot head are located right before the cutting area, thus producing a cleaner cut with every pass. The digital displays on these two are also different. The 9290cc shows how many minutes of power remain on the rechargeable battery. The 9700 shows the approximate percentage of battery power left on the shaver. Extra indicators are included to let you know when the shaver is being cleaned. Both models have their displays on their bottom parts. 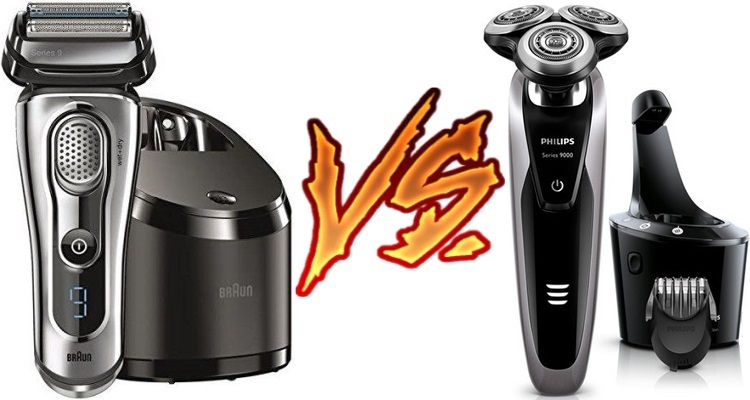 Next on the comparison list is the second-highest levels of shavers the two companies produce. The Braun 7865cc produces thousands of microvibrations per minute. The motor adjusts that total based on how thick your hair is. The shaver runs slower when the hair is thicker. The Norelco 9300 collects hair via a series of foil rings on each cutting head. The hair is picked up and positioned straight, thus reducing the risk of burns or tears on the hair. The ring goes along more parts of the skin to produce a close effect. The design collects more hair and can also adapt to the curves around your face. Both shavers let you adjust the trimming motor’s power, but the Series 7 7865cc uses five settings versus three on the Norelco 9300. Also, the 7865cc has its control features on the bottom of its body while the 9300 has those controls on the top. While the batteries on these two last for the same amount of time, the Norelco 9300 offers a quick-charging feature. 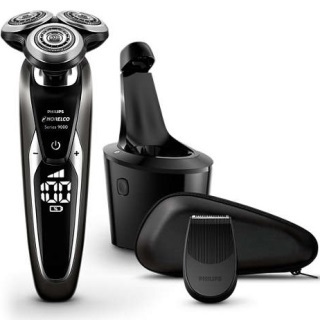 The 9300 can be charged up in five minutes to get enough power for a single shave. The shaving elements on these two are also different. The 7865cc uses three cutting points and a skin guard. The 9300 includes the traditional tri-head rotary top and a separate trimmer. To use the trimmer, you would remove the rotary top and then snap the trimmer attachment on. This feature is designed for sideburns and other sensitive spots that need extra care. Both models have dedicated cleaning stations. The Braun Clean and Charge and Norelco SmartClean stations clean all hair, gel, or other shaving materials off in a hygienic base while also charging the batteries. The next comparison focuses on two intermediate models for your convenience. Both the Braun Series 5 5190cc and Norelco 8900 use trimmer attachments, but the ways how they are applied are different. The 5190cchas a pop-up trimmer. The piece moves up from the back part of the shaver. The trimmer does well with collecting your hair, although this may work for when you are preparing for a much closer shave. The Norelco 8900 also uses a trimmer attachment that you add after removing the basic rotary head. The attachment uses a small comb to gather hair before it cutting. The comb is called a Beard Styler and comes with five adjustable lengths for beards and sideburns. The blades are a little narrower than what the Braun shaver uses, but the attachment should still get the job done. The lifting motions are different on these two. The 5190ccuses a small bar housed in the middle of three shaving foils. The bar pre-trims the hair to simplify how the bar collects it. The bar then lifts the hair up to clear out difficult surfaces that need to be trimmed. On the other side, the 8900 uses a lifting ring for the hair that keeps the cutting surface up before the blade goes through. The batteries on the two models are somewhat different in that the 8900’s battery lasts longer on a full charge. But no matter which model you use, you will have something that can charge up in an hour. The two models are also light in weight. 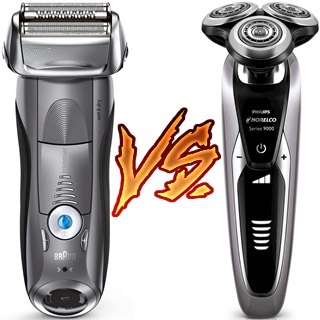 They are both a little over a pound in weight each, so you should not experience fatigue when holding either shaver. Don’t forget that they can both work in the shower. These last two electric shavers are entry-level models, but they both work quite well. The Braun Series 3 3040s uses a two foil trimmers with a riser bar in the middle and a pop-up trimmer on the side. The Norelco 5100 has a tri-head rotary layout with a separate styling attachment that snaps on the base. The blades on the 3040s are pressure-sensitive. They will change in speed based on how much pressure you apply or how intense the hair being captured and cut may be. The foil heads will tilt back and forth based on how you position the shaver. The small comb or riser bar lifts more hair from your first stroke. The second foil bar will capture the hair from the bar and cut it even further. The blade system on the Norelco 5100 uses foil rings that change in density. A few bars are found on some parts of the rings, but a couple of circular points are also added for collecting smaller hair bits that might be missed. The shaving heads bend in five directions. The heads position themselves well even on your neck and jawline. Also, two blades are used in the 5100. The first blade lifts the hair, while the second one cuts below skin level for a smooth and safe trim. Both shavers have batteries that offer a five-minute quick charge option. Each model is also waterproof and can be used in the shower or with a shaving gel or cream. By now, you have noticed that Braun and Norelco have different approaches to how they handle shaving. The Braun shavers use straight motions while Norelco’s use rotary movements. The lifting mechanisms in each unit are also different from one another. But no matter what you choose, you will find a shaver that fits your personal care needs. Feel free to look at as many Braun and Norelco shavers as you wish. 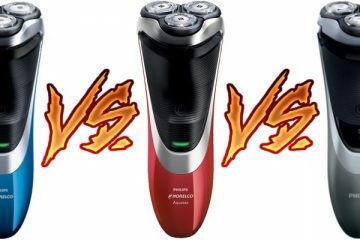 This Braun vs Norelco comparison should have hopefully helped you recognize what you need for making the most out of your shaving work. 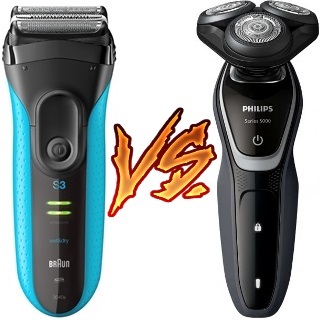 Philips Norelco 9700 vs 9800: Which Electric Shaver Is Better?